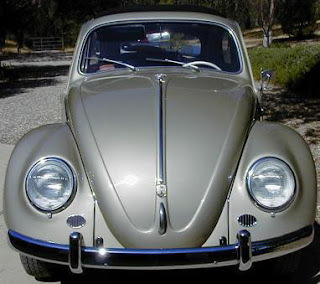 My Volkswagen Type 1 was manufactured and completed at Volkswagen GmbH in Wolfsburg, Germany on the 4th of September 1958. It came with the color L 243 Diamond Grey and grey/green leatherette with US spec equipment (#350) and white wall tires (#128). It left the factory the very next day for the port of Miami, Florida. The first owner of the car was a lady who always loved her Volkswagen. She bought the car with the intention of never selling it or getting another car. In fact, when she passed away she was still driving her Volkswagen. Her son worked at a car dealership and would always offer her the latest and greatest new cars, in which she would reply "I've got my Volkswagen". When she passed away the car was brought to the dealership where it sat. Her son never did anything with it and one day the dealership came up for sale. The dealership was purchased and the new owner took over. 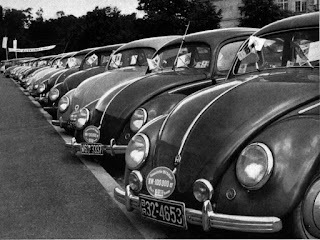 One day an employee asked the owner if he could buy the Volkswagen. The manager had no problems with this and the 2nd owner of the bug repainted it and got it ready for his daughter. As typical with teenagers, the car wasn't cool or fast enough so the 2nd owner sold it. Once again the bug was off to a new home and the third owner had intentions of restoring it. He taught his son how to drive stick in it and used it for fun around town. His brother asked him why he never did anything to it and maybe he should sell. As I drove away that day, there were tears in his eyes. He was very generous to me and I thought it was almost a dream. I had given him an offer and he told me to go lower! The car needed some work to become legally road worthy and he felt that it was going to the right home. I still can not thank him enough for the opportunity he gave me. This is the 2nd Bug I've owned, the first one being a 1972 Beetle, and this one was definitely a diamond in the rough. Here in Florida, old air cooled VW's are hard to find and when you do most of them are rusted through. I had hit the jackpot and found my 1959 virtually rust free bug. The engine, transaxle, pans, and body numbers all match up and there is still some of the original color in the interior. The door panels and possibly the seat covers also look to be original. The chances of finding 25% of these things in my area is one in a million! I was so very lucky! I have many plans for the bug and I hope to do a stock restoration when time and money become available. It will most likely be a drawn out process, but school and work come before cars and I know one day I'll get what I want.